Inspired by the Star Trek tricorder, engineers and physicians at the Johns Hopkins University School of Medicine have developed a hand-held, battery-powered device called MouthLab that quickly picks up vital signs from a patient’s lips and fingertip. Updated versions of the prototype could replace the bulky, restrictive monitors now used to display patients’ vital signs in hospitals and actually gather more data than is typically collected during a medical assessment in an ambulance, emergency room, doctor’s office, or patient’s home. The MouthLab prototype’s measurements of heart rate, blood pressure, temperature, breathing rate, and blood oxygen from 52 volunteers compared well with vital signs measured by standard hospital monitors. The device also takes a basic electrocardiogram. The study was published in the September issue of the Annals of Biomedical Engineering. The MouthLab prototype consists of a small, flexible mouthpiece like those that scuba divers use, connected to a hand-held unit about the size of a telephone receiver. The mouthpiece holds a temperature sensor and a blood-volume sensor. The thumb pad on the hand-held unit has a miniaturized pulse oximeter for measuring blood oxygen level— a smaller version of the finger-gripping device used in hospitals. Other sensors measure breathing from the nose and mouth. MouthLab also has three electrodes for ECGs — one on the thumb pad, one on the upper lip of the mouthpiece and one on the lower lip. These work about as well as the chest and ankle electrodes used on basic ECG equipment in many ambulances or clinics, says Fridman. That ECG signal is also the basis for MouthLab’s novel way of recording blood pressure. When the signal shows the heart is contracting, the device optically measures changes in the volume of blood reaching the thumb and upper lip. Unique software converts the blood flow data into systolic and diastolic pressure readings. The study found that MouthLab blood-pressure readings effectively match those taken with standard, arm-squeezing cuffs. The goal of rapid medical assessment (RMA) is to estimate the general health of a patient during an emergency room or a doctor’s office visit, or even while the patient is at home. Currently the devices used during RMA are typically “all-in-one” vital signs monitors. They require time, effort and expertise to attach various sensors to the body. A device optimized for RMA should instead require little effort or expertise to operate and be able to rapidly obtain and consolidate as much information as possible. 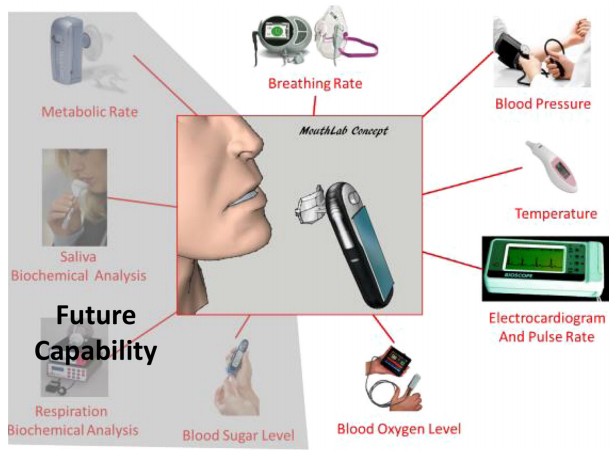 MouthLab is a battery powered hand-held device intended to acquire and evaluate many measurements such as non-invasive blood sugar, saliva and respiratory biochemistry. Our initial prototype acquires standard vital signs: pulse rate (PR), breathing rate (BR), temperature (T), blood oxygen saturation (SpO2), blood pressure (BP), and a three-lead electrocardiogram. In our clinical study we tested the device performance against the measurements obtained with a standard patient monitor. 52 people participated in the study. The measurement errors were as follows: PR: −1.7 ± 3.5 BPM, BR: 0.4 ± 2.4 BPM, T: −0.4 ± 1.24 °F, SpO2: −0.6 ± 1.7%. BP systolic: −1.8 ± 12 mmHg, BP diastolic: 0.6 ± 8 mmHg. We have shown that RMA can be easily performed non-invasively by patients with no prior training.